‘Meticulously researched and sumptuously illustrated with old maps and paintings, Ian Burnet’s second book, East Indies, tells the fascinating story of the rise of the trading empires of the Portuguese, Dutch and English which led to the colonisation of much of the Asia by European powers. From the early 16th Century traders, adventurers, priests and pirates were lured by the promise of the great riches to be had in commodities such as spices, sandalwood, silks, gold and Christian converts. 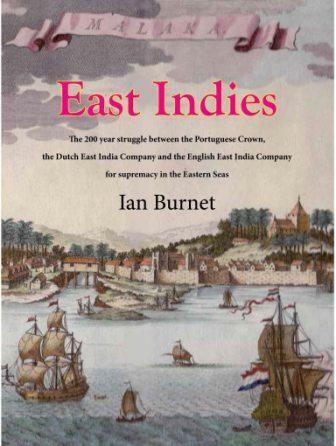 “When you read ‘East Indies’ by Ian Burnet, you can almost smell exotic spices over salt spray and wet wood of the ships that transported the goods back to Europe. “Ian Burnet has followed his scholarly and eminently readable book ‘Spice Islands’ with his follow up ‘East Indies’. Burnet has been enthralled with the history of the Spice Islands and Indonesia to the point of extensive travel and living in the region. Where is first book examined the great spread of history of the development of the spice trade and its impact on Europe (not to mention the islands themselves), the second book focuses on the struggles for dominance over 200 years between the great trading and naval powers of the Portuguese, Dutch and the English. The book provides a wonderful snapshot of European activities in the East Indies including the establishment of Singapore and Hong Kong as significant trading ports. This book will appeal to readers who want to take further their understanding of the development of the region”.